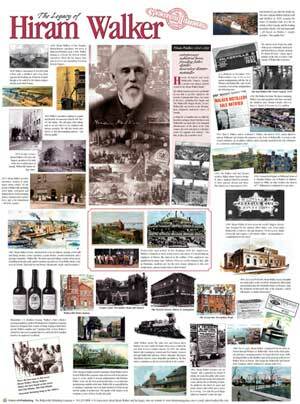 Commemorative poster celebrates the life and times of Hiram Walker, founder of Canadian Club whisky and Walkerville. Beginning with his purchase of lands in the wilds of Essex in 1858, the poster traces the amazing influence of the man whose legacy remains one hundred years after his death. This poster and all information was meticulously researched by your friends at The Walkerville Times.